The Starry Night was completed in 1889 with oil paint on a canvas. The Starry Night was created within an asylum, the Saint Remy de Provence, in France that van Goghcommitted himself too in his later life. “This morning I saw the countryside from my window a long time before sunrise, with nothing but the morning star, which looked very big,” wrote van Gogh to his brother Theo, describing his inspiration for The Starry Night. The curving, swirling lines of hills, mountains, and sky, the brilliantly contrasting blues and yellows, the large, flame-like cypress trees, and the thickly layered brushstrokes of Vincent van Gogh’s The Starry Night are ingrained in the minds of many as an expression of the artist’s turbulent state-of-mind. 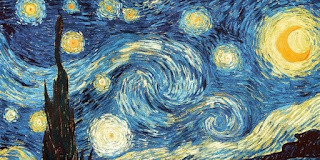 The Starry Night is among the most popular paintings in the world. Although The Starry Night was painted during the day in Van Gogh’s ground-floor studio, it would be inaccurate to state that the picture was painted from memory. It is located in the Museum of Modern Art in New York. The Planet Venus Is In It. By the time Van Gogh painted The Starry Night, his already fragile mental state had deteriorated, and he had been submitted to the Saint-Paul-de-Mausole asylum. The village painted in The Starry Night is partially inspired by the village that was situated across from his asylum, but it is also pulled from his own pool of subjective images. It is also thought that his homeland, the Netherlands, helped to form the village so depicted.